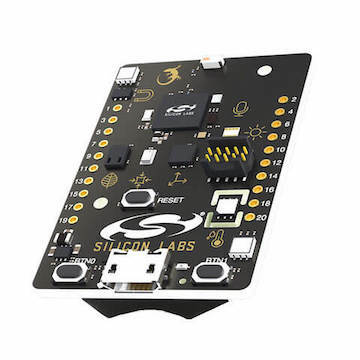 The EFR32™ Mighty Gecko Starter Kit EFR32MG-SLTB004A (a.k.a Thunderboard Sense 2) contains a MCU from the EFR32MG family built on ARM® Cortex®-M4F processor with low power capabilities. The default configuration can be found in the defconfig file: boards/arm/efr32mg_sltb004a/efr32mg_sltb004a_defconfig. The EFR32MG SoC has eight gpio controllers (PORTA, PORTB, PORTC, PORTD, PORTF, PORTI, PORTJ and PORTK). In the following table, the column Name contains Pin names. For example, PE2 means Pin number 2 on PORTE and #27 represents the location bitfield , as used in the board’s and microcontroller’s datasheets and manuals. The EFR32MG SoC is configured to use the 38.4 MHz external oscillator on the board. The EFR32MG SoC has four USARTs and one Low Energy UARTs (LEUART with 9600 maximum baudrate). USART0 is configured as the Zephyr console and is connected to the On-Board J-Link Debugger that presents a virtual COM port for general purpose application serial data transfer with this interface. A USB connection to the host computer, which exposes a Mass Storage and a USB Serial Port. A Serial Flash device, which implements the USB flash disk file storage. Connect the EFR32MG-SLTB004A to your host computer using the USB port and you should see a USB connection which exposes a Mass Storage (TB004) and a USB Serial Port. Copy the generated zephyr.bin in the SLTB004A drive.